Most Republicans correctly diagnose this dysfunction of liberalism. Too many Republicans, however, fail to provide a prognosis for replacing the liberal approach to government. Simply doing away with the New Deal and Great Society programs is unrealistic and inappropriate. Republicans need a leader that can communicate a vision for transforming these programs. As a Conservative, there are two fundamental tenets on which my beliefs are based: a profound faith in my fellow human beings and a healthy awareness of the state’s limitations. We have reached a point where the size, scope and inflexibility of our government is inhibiting, not advancing, the march of progress. Indeed, I would go further. By undermining social and personal responsibility – the building blocks of any contented community – it is making things worse. The net result is a failure to tackle entrenched social problems and the consequent diversion of funds away from other services. This is why the Conservative programme for government is founded on such a radical revolt against the statist approach of the Big Government that always knows best. … And it is in keeping with an age in which power is being diffused, the public mistrusts politicians and the internet is shattering traditional models of delivery. It is the Big Society – and it will change our nation by bringing people together to improve life for themselves, their families and their communities. The stifling clutch of state control will be replaced by the transformative power of social responsibility. We will do this by making government more transparent and accountable and by breaking open public services to new providers, unleashing the forces of innovation. The state, of course, will still have a pivotal role, ensuring public services are properly funded to maintain universal cover and guaranteeing standards of provision. But it will have to resist its natural instinct to command and control, loosening its grip to hand over the reins to those who might run services better or deserve a bigger say in the outcomes. Just as government has to change, so too must society. For this vision to succeed, we need mass engagement. By redistributing power, we can pave the way. The question is if there is a will to follow that path. All this raises a wider question of accountability. Taxpayer money will be going to co-operatives, neighbourhood groups, charities and social enterprises – how can we ensure that money is spent wisely? There will, of course, be standards for new providers to meet. But beyond this, I would argue two things. First, by unlocking innovation, we will discover new and better methods of delivery. And second, the most powerful weapon in the armoury for accountability is choice. So wherever possible, we aim to give the public a bigger say in their public services. For example, we will pay schools by the number of pupils they attract. More pupils, more money. Conversely, a dwindling school roll will act as a powerful impetus for improvement. In areas where choice is more difficult, such as crime prevention or helping the jobless, we will pay by results. Stop people reoffending, or get the jobless into work, and there is extra money for expansion. The Big Society will take the welfare state into the 21st century, with public services tailored to the needs of their users. They will be cheaper to deliver, with waste and inefficiency driven out. And it gives us the chance to tackle the deepest social problems while bringing communities together. It might even restore people’s trust in the political process. One day, we will look back in amazement at the idea that the state clung on to its data, ran a near monopoly for schools and was so flat-footed in the face of crime and poverty. It will seem as antiquated as the days when we had to wait months for a telephone line because there was a state-run phone company. So let’s stop hanging around and get the people off the hook of state control. The Big Society can change our world. Together, we can make it happen. 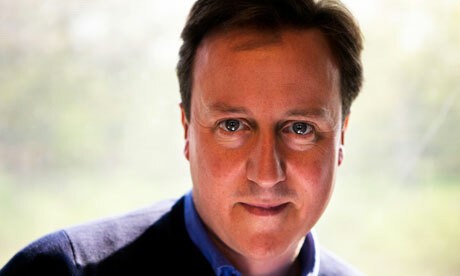 Cameron, however, is not a perfect candidate. He has two major flaws. First, he is not a natural born citizen (and has the birth certificate to prove it). Second, he already has a job (as Prime Minister of the United Kingdom). Regretfully, therefore, I must find another candidate to endorse. So, as the Republican field emerges over the next several months I will need to find someone else to endorse, and that endorsement will go to the candidate most like David Cameron. This entry was posted in Government, Republican and tagged 2012 Election, David Cameron, Elections, Presidency by Napp Nazworth. Bookmark the permalink. I didn’t recognize David Cameron at the Brit. Priminister until the end. Well done old chap. Wolud like to see you lay out your preference for the social safety nets v/s what we currently have. Cameron mentioned the use of vouchers for public education. This would be a good example of a way to get rid of the many layers of gov’t bureaucracy, and put more of the decision-making in the hands of the parents. It would take us from centralized gov’t planning to decentralized individual planning. Here is another example-http://www.learningaboutpolitics.com/2011/04/purple-health-plan.html. Though, it does contain some centralized gov’t planning (which represents the “blue” in the “purple” plan).